The Basel III regulatory framework includes two quantitative liquidity requirements. The Liquidity Coverage Ratio (LCR) requires banks to hold sufficient high-quality liquid assets to meet a 30-day episode of systemic and idiosyncratic liquidity stress. 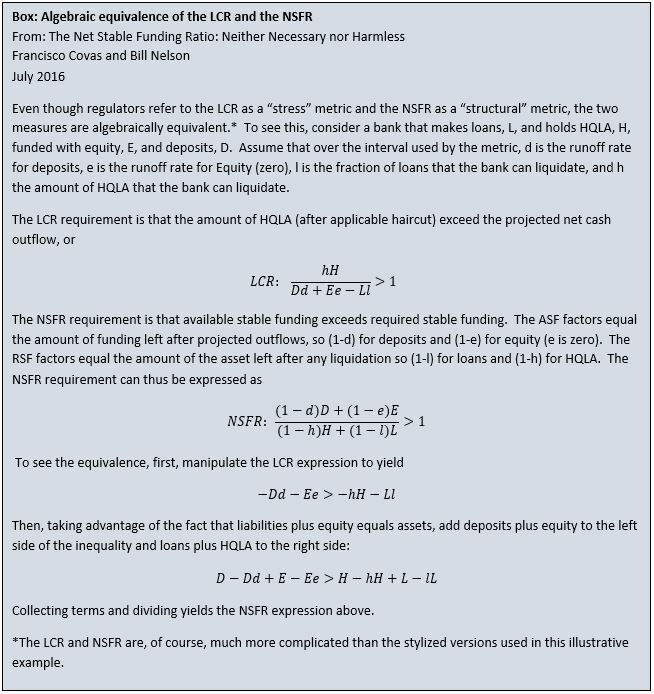 The Net Stable Funding Ratio (NSFR) was originally designed to ensure that banks have sufficient liquidity to meet a one-year period of liquidity stress that is less severe than the stress assumed in the LCR. Although the official purpose of the NSFR was subsequently changed and is now obscure, the standard itself was not inherently changed, so we proceed under the assumption that the original purpose is still the actual purpose. In the U.S., the LCR has been adopted and effective as of January 2015, but the NSFR has only been proposed. This post describes how it would be possible to design a single liquidity regulation that could replace both the LCR and the NSFR simultaneously. This is not to say that the LCR and NSFR are redundant. They each serve a purpose. The stress inherent in the LCR is more severe than the NSFR, so it is possible to survive the NSFR stress for a year but not the LCR stress for 30 days. Conversely, it is also possible to be liquid at 30 days under the LCR stress but not make it to a year under the NSFR stress. Perhaps most importantly, having a 30-day requirement without a longer-term requirement provides an incentive for banks to bunch up their funding at 31 days, creating an undesirable funding cliff. First, as explained in detail in the box below (taken from Covas and Nelson (2016)) even though the LCR and NSFR appear quite different, apart from their different horizons and scenarios, their structure is algebraically the same. The LCR is built on information about the bank’s balance sheet and assumptions about inflows of bank liabilities and outflows of bank assets over a stress period. The NSFR is based on assumptions about the amount of assets and liabilities remaining after a stress period. Clearly, the amount of assets remaining is the current amount minus outflows. The amount of liabilities remaining is the current amount minus inflows. Second, in the U.S., the LCR is not based on the bank’s liquidity condition at the end of 30 days (the Basel standard), but instead, on the bank’s deepest liquidity need over the 30 days. The logic of the U.S. approach is that there is no point in being OK at 30 days if you don’t make it to 30 days. A single liquidity regulation that would replace the LCR and the NSFR could be designed along similar lines. Banks could be required to maintain sufficient liquidity to survive continuously for one year consisting of 30 days of LCR-level severe stress followed by 11 months of moderate stress, with the 12-month stress level averaging out to NSFR-level severity. That is, each bank would be required to maintain enough liquid assets to meet its peak need over the year, although to reduce complexity, the calculation could be done for only a handful of horizons (such as overnight, one week, one month, 3 months, 6 months, 9 months, and a year). This approach would be slightly tougher than the combination of the current LCR and the proposed NSFR. A bank that passed this single regulation would be guaranteed to pass the LCR and NSFR. However, a bank that passes the LCR and NSFR wouldn’t necessarily be able to pass the unified regulation because the NSFR as proposed is not calibrated to the deepest need over the year. Put another way, a bank can pass the NSFR and not make it to the end of a year with stress as assumed in the NSFR. To implement the single regulation, some inconsistencies between the LCR and proposed NSFR would need to be ironed out. As just one example, under the LCR a bank is assumed to be able to sell all its Treasury securities in 30 days of severe stress but under the NSFR it is assumed to be able to sell only 95 percent over one year of less severe stress. Forcing the regulations to be mutually consistent is a feature, not a shortcoming, of this approach, however.